Acquired: Signed as a free agent on Sept. 9, 2015. Re-signed March 6, 2017. 2018: In 18 games (18 starts), O’Donnell played at right guard and left tackle. 2017: In 18 games (18 starts), O’Donnell played at right guard and finished with one tackle. O’Donnell started at guard in the West Semi-Final and West Final. O’Donnell was named a West All-Star and earned the club’s nomination for the Jake Gaudaur Veterans’ Award. 2016: In 18 games (17 starts), O’Donnell started at guard and had one tackle. O’Donnell started both the Eastern Semi-Final and Final at right guard. 2015: O’Donnell played in eight games (eight starts) at left and right guard. He started the West Final and Grey Cup at right guard. 2014: In 18 games, O’Donnell started 15 games at right guard and saw action at right tackle. He started at right guard in the West Semi-Final against Saskatchewan and the West Final against Calgary. 2013: In 18 games (18 starts), O’Donnell started eight games at left guard and 10 games at right tackle. He was the Eskimos nominee for Most Outstanding Offensive Lineman. 2012: Signed with the Eskimos on Sept. 17, 2012 after his rights were traded to Edmonton from Saskatchewan along with a fourth round pick in the 2013 CFL Draft in exchange for import wide receiver Greg Carr and a fifth round pick in the 2013 CFL Draft. O’Donnell played six games (one start) along the offensive line. On October 13, he stepped in as long snapper for the second half when Ryan King sustained an injury and recorded a special teams tackle. He started the East Semi-Final. 2011: O’Donnell was drafted by the Saskatchewan Roughriders in the second round (15th overall) in the 2011 CFL Draft. He opted to sign with the Cincinnati Bengals where he spent the season on the Bengals practice roster. Pro: Attended training camp with the NFL’s Cincinnati Bengals in 2015. College: O’Donnell played his college football with Queen’s University in the CIS where he was a standout. 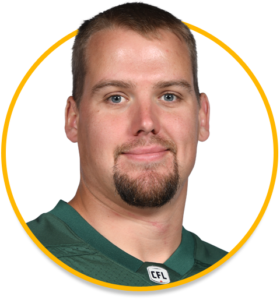 He collected several awards throughout his career, including the Orrin Carson Memorial Trophy for Best Offensive Lineman in 2009 and 2010 and first team All-Canadian in 2009 and 2010. Personal: O’Donnell had a tryout with the NBA’s Boston Celtics and Toronto Raptors in 2011.